One of the best parts about being a god is all the cool weapons you get to wield. From Thor’s hammer to the lightning bolts of Zeus, gods have had some pretty awesome destructive tools throughout history. 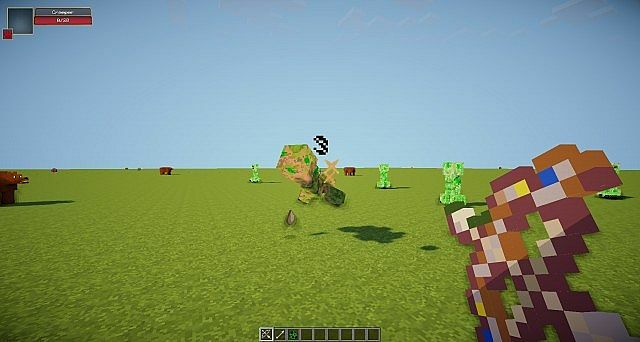 The God Weapons Mod for Minecraft is a creative mod that adds all sorts of godly weapons to the game. Those weapons include items from Greek mythology, Norse mythology, and other religious systems. -Zeus’ Lightning Bolt: Does the same damage as a diamond sword, but also lights enemy mobs on fire. Also provides players with a jump boost for 35 seconds and will throw hostile mobs into the air. -Poseidon’s Trident: Does three more damage than a diamond sword and also gives players the ability to breathe underwater for 75 seconds. -Ares’ Spear: Does the same damage as a diamond sword and also poisons mobs for 5 seconds. Gives players a speed boost for 35 seconds. -Annabeth’s Dagger: Does 1 fewer damage point than a diamond sword but harms mobs for an additional three seconds. -Apollo’s Bow: Does exactly the same damage as a normal bow but has an unlimited number of arrows. -Artemis’ Bow: Requires Silver Arrows in order to use; lights enemy mobs on fire when punched with the bow (not with the arrow). Grants the wielder invisibility for 35 seconds when performing a melee attack with the bow. 7 weapons have been added to the game in total. The mod also adds one new ore – Silver Ore – which is required for several of the recipes. 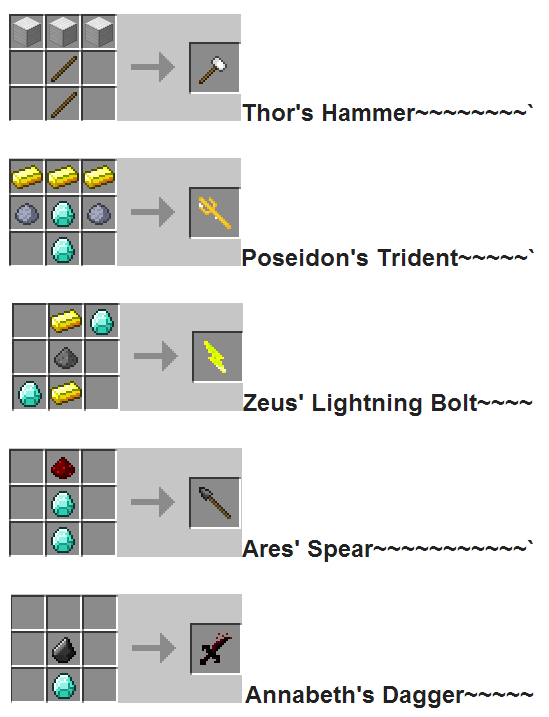 In addition, there are two new items: Silver Ingot and Golden String. The Golden String will be needed in order to craft the two new bows. Since most of the god weapons included in this mod do the same damage as a Diamond Sword, don’t expect this mod to unbalance the game too much. The weapon effects will make you feel powerful and godlike but you will still get into plenty of challenging fights with enemy mobs. And, since the weapons require a significant number of valuable materials to craft, you’re not going to make them out of a few wood sticks and dirt blocks. For all of these reasons, the God Weapons Mod is one of the better mods out there today. It adds cool new weapons to the game without totally ruining the challenge of Minecraft or the challenge of defeating enemy mobs. You can check out the God Weapons Mod today by following the easy installation instructions below. Step 5) Start playing and enjoy!